Customizable map of 896 Paris polling stations. Color, customize this map of Paris polling stations with your software: Excel, Powerpoint, Illustrator, Inkscape, Photoshop. This work document includes the 896 polling stations in Paris identified by their district number and their official station number. The complete list of addresses for these station is provided in Excel and CSV files. Plan of all streets of Paris city - France. Illustrator and Eps files. Other formats on demand. 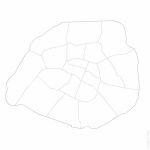 Vector map of Paris with boroughs and districts named in PDF, Illustrator in layers and SVG. Plan of all streets of Paris city - with name. Eps files in layers. vector map of the first district of Paris with streets + name subway stations + name, boulevards, avenues, streets, lanes, parks and gardens, monuments and hydrography. vector map of the second district of Paris with streets + name subway stations + name, boulevards, avenues, streets, lanes, parks and gardens, monuments and hydrography.